I just open my precious hard-cover first edition Harry Potter and the Goblet of Fire. Guess what I found? Mould! Yellowing pages! Truly a nightmare! Considering the book was not published a century ago, I only have myself to blame. I immediately took out all the book and aired them outside. Forgive me oh my precious. This is why I truly need my own library. My current “library” is basically my bedroom. The collection was separated into two places. One is in the multi-tasking cabinet (vanity above and book cabinet below). 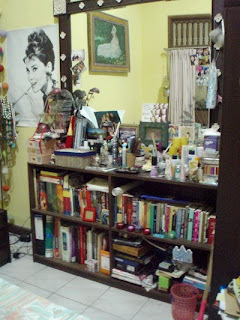 It is where I put my precious hard-covers, art & history books, albums and coffee table books. The second “cabinet” is well, not a cabinet. More like a window sill. Oh who am I kidding, it is window sill. Definitely not a good place to put books but I don’t really have any choice at the moment. You see, in my family, me and my father are the only one who actually likes to read. He is now deceased and it left only me. I, somehow, doubt that I can trust my treasure to the hand of my mother (who dusted everything with her chicken feathered broom) or my brother (who simply doesn’t care and think that book is so ‘uncool’). It left me with my window sill. 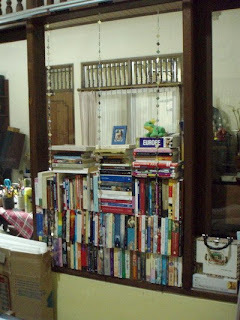 Books in my window sill are the temporaries which means I eventually trade them with new books or second-hands. However, I also found a very good article in kimbooktu about how to take care of your books (and become a book doctor). Very important information for you who likes to buy antique or second-hand books.